2. Find the 6th photo in that folder. 3. Share the photo on your blog and give the details of the photo. 4. Tag 5 folks to do the same. So using Flickr I went six sets back from the beginning and counted six photos in from the beginning of that set. This was it. 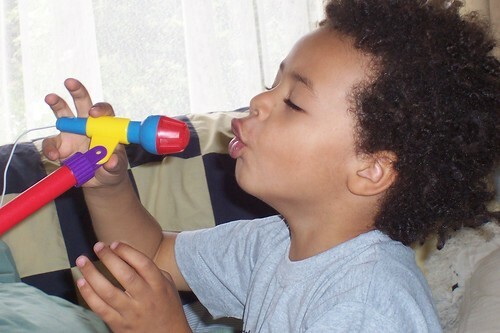 It’s JJ at Christmas 2005 when he was four and he got a little piano with a microphone. For some reason I don’t mind noisy toys like this to a point. The point being that they’re used away from me after the noise becomes too grating. So, the meme said to find your 6th photo folder and I didn’t know whether it was from the earliest or latest. Therefore I did both and it came up with yet another photo of JJ. What a coincidence, but then my Flickr account consists of a lot of photos of my boy. As I said to a colleague who was looking through my photos the other day it’s a document of his life, just like this blog. 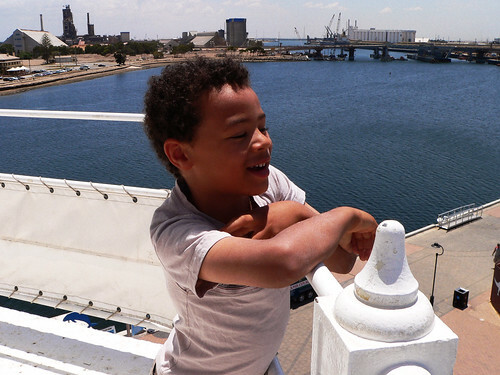 Here he is at the beginning of this year after we’d been to the Martime Museum at Port Adelaide on the top of the nearby lighthouse. Now I’m supposed to pass this onto five more people to do with what they will. So, Tiff, Trish, Jeanie, Kikolani and Cellobella, over to you. thanks I think it is a cute idea. JJ was a cutie pie even then. I am with you on noisy toys …cute to a point then I hope they break quickly or get lost for a few weeks. I keep forgetting to look back through old pictures – precious memories easily forgotten. Finally I have done my response to this meme!!! And then I come back and note I didn’t even comment on it in the beginning – sorry. What I love about your photos of JJ is that he is so vibrant – I am sure he is like that in real life too. Yay, I’ll go and have a look. Vibrant sure is one way of describing JJ. Livewire is another.